Subject: Supporting the safe implementation of Performance Based Navigation (PBN) operations at Ireland West Airport Knock. Ireland West Airport Knock (‘Knock Airport) is Ireland’s 4th busiest airport and is experiencing an increasingly demanding aeronautical environment. The Airport’s management team had identified benefits to be gained from the implementation of PBN in the airspaces surrounding the Airport. However, not being fully conversant with the requirements or operations associated with PBN, the Airport sought external technical support to understand the specifics and, where feasible, support implementation. Area Navigation (RNAV) Instrument Flight Procedures (IFPs) were proposed that were underpinned by Global Navigation Satellite System (GNSS) technology, introducing new risks into the operation as well as benefits. The Airport management were keen to learn more about PBN operations, the technical infrastructure required to facilitate these and how these would ‘fit’ at Knock Airport. Most importantly, prior to any aircraft operators conducting RNAV(GNSS) IFPs at Knock and Air Traffic Control (ATC) staff handling such movements, it was essential that the project’s development and future transition be conducted efficiently with safety being the focus throughout. Sufficient safety assurance would be needed, to ensure proposed changes were acceptably safe to both the Airport’s accountable management and the Irish Aviation Authority. To ensure that a common understanding of the GNSS technologies and RNAV methodologies existed across stakeholders, Cyrrus delivered a comprehensive briefing for non-specialists, ensuring a common level of understanding. This was essential when discussing safety critical systems and situations. Project activities could then be entered into with confidence by those inexperienced in this field. 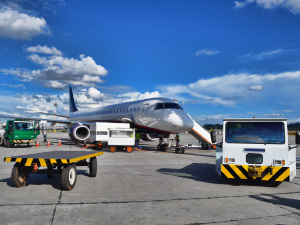 Empowered with an appropriate level of technical knowledge, Airport staff could now contribute significantly during subsequent safety-oriented activities led by Cyrrus: including hazard identification, risk management and transition planning. A project to implement RNAV(GNSS) IFPs would present a considerable challenge to many Airport professionals. The knowledge and experience required to plan and deliver such a paradigm shift in operational capability would make this a significant project for many organisations to undertake, as was echoed at Knock. Fortunately, Cyrrus were able to provide clarity and direction to the Airport’s management, guiding project safety to a successful conclusion. From the identification of client needs through to the delivery of a comprehensive safety case and provision of transition support, Cyrrus steadily guided the Airport along a path. Using a step-by-step checklist to highlight key activities to be conducted, a list of critical documentation was also provided for the Airport to develop as they progressed towards transition. After all, the Knock Airport team are their own local experts who would be implementing RNAV(GNSS) IFPs within their airspace. Cyrrus empowered them through the provision of education, robust process, objective guidance and expertise in safety case development. In turn, Knock Airport has successfully extended this knowledge to its ATC staff, who can now manage PBN operations safely and with confidence. Airport managers also benefited from Cyrrus with the reach back capability provided in airspace change and safety management support. Most importantly though for Cyrrus, we have supported another client with achieving their objective of having increased Communications, Navigation, Surveillance and Air Traffic Management capability and greater resilience, all underpinned by safety assurance provided by the helping hand of Cyrrus.